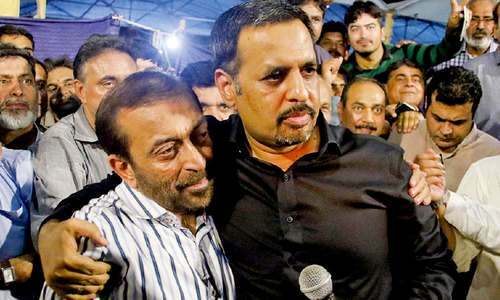 Pak Sarzameen Party (PSP) Chairman Mustafa Kamal at a press conference in Karachi on Saturday alleged that the establishment called upon his party to form an alliance with the Farooq Sattar-led Muttahida Qaumi Movement-Pakistan (MQM-P) upon Sattar's request. Kamal's press conference comes as a response to developments following the announcement of his party's alliance with Muttahida Qaumi Movement-Pakistan (MQM-P) earlier this week. Kamal said Pakistanis were being given the impression that the establishment was behind the political alliance between MQM-P and PSP. Confirming the speculation, he said the establishment had been calling the PSP to meet MQM-P at the request of Sattar for past eight months. "Today I want to tell all of Pakistan that, yes, the establishment called us and made us meet Farooq Sattar. When we reached, Sattar was already there and it was on his request that we were called. This did not happen a few hours ago. 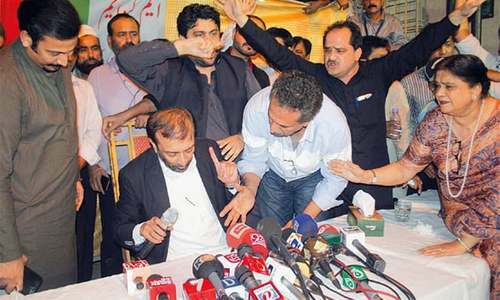 Sattar and his team have been calling us with help from the establishment for the past eight months," he claimed. "This is not a plan that is eight months old, however. It is a plan that started on Aug 22, 2016, when Farooq Sattar was [put in charge]," he added. "I am not an agent [of the establishment]. If I was, I would not leave my senatorship in 2013." "I will end my party and ask my workers to return home, but I will not be a part of the MQM because the MQM was and still is Altaf Hussain's, and will continue to be... Altaf Hussain is a traitor and a Research and Analysis Wing agent. If he is working openly for RAW, he is not doing any work for his own country," he alleged. He accused the MQM of still being close to the party's founder, saying that they had not once said a word against Hussain throughout the drama that unfolded this past week. "An alliance happens between two parties. If I don't believe in the MQM at all, how can I forge an alliance with them?" he asked. Kamal said he had been making efforts in numerous parts of Pakistan and around the world in many countries and "thousands of people" are joining his party. "Is it all done by the establishment?" he questioned. Kamal said it was his party that had convinced the establishment to release 70 missing Mohajir men. Kamal alleged that his party was accused of being establishment-backed, but it was MQM-P that was formed at the Rangers headquarters "under the supervision of [then DG Rangers] Gen Bilal Akbar". 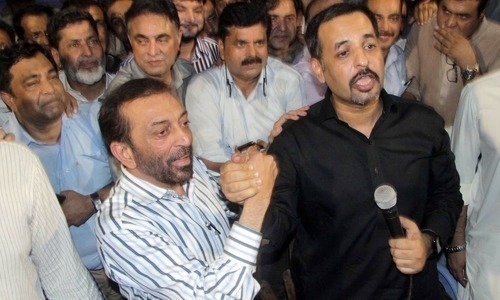 He alleged that MQM-P leaders had been feeding "half-lies" to the media that Sattar had been kidnapped and later made to address the press conference announcing his party's alliance with PSP. In fact, it was Sattar himself who was requesting the meetings, he said. Addressing Sattar directly, Kamal said the MQM-P chief often expresses the concern that his (Sattar's) party's mandate will be split in the 2018 general elections, but questioned why the party has done nothing to improve the socio-economic conditions of Karachi despite already having the mandate given to them by the Mohajirs. "What did Mohajirs get [in return]?" he questioned. He said those exploiting the name of Mohajirs for their political goals are in fact the biggest enemies of Mohajirs. Kamal said both MQM and PSP leaders including himself had done politics in the name of Mohajirs for 35 years but the city had had enough of such politics. He said those who are talking about the welfare of all types of people are being termed anti-Mohajir, and asked those using the name of the Mohajir community: "What have you done for the Mohajirs?" The PSP chief said if he didn't talk about the welfare of all communities, the Mohajirs would get no benefit either. Taking a swipe at Farooq Sattar, Kamal said even if his mother had been alive, he would not have involved her in politics "to hide my deeds". Is the MQM-PSP merger part of a strategy to make a dent in Altaf's following? This is absurd. Mustufa Kamal must be trialed.May democracy prevail. Having accepted that PSP deals with establishment,I demand blanket ban on PSP. Back to the "Establishment" games. Well done Establishment..... Let's deal with the corrupt Pml-n & PPP... then go after the minor crooks. Kamal must be trialed in court as this is unconstitutional and illegal. Kamal must be investigated right away. Mustafa Kamal's claim that he got hundreds of MQM criminals released from Law agencies thru his influence speak the reason why these workers were arrested. Sorry Mustafa Kamal; you don't have any credibility left. Finally, Mustafa Kamal lost his gained respect. He still has to answer .the question of where did he get a Prado and a new Bungalow on Khayaban Seher?. Good points raised by him. Establishment brokered MQM-PSP alliance meet at Sattar's request because Farooq is losing his grip. being a mayor of Karachi that was your job. so its not to be proud. The difference is that you worked with honesty and worked hard. The time is exposing all characters of this party one by one. Mustafa Kamal is last hope for Karachites. It's high time they stop playing Muhajir Card and be good Pakistanis. I'm also a Muhajir from Punjab but we never call ourselves Muhajir because it may create divisions. We are just Pakistanis. Now that you have learnt the game of the establishment, please don't let them play any more tricks on you, unless you have to oblige them for making way for you in the first place. Honourable institutions with power should take notice. Why no action has been taken against Mustafa Kamal after he made such claims and statement about honourable establishment. On the other hand honourable establishment is very quick to take strict action against the most loved political party of Urban Sindh. Why the difference in treatment? It's now high time for all those near to Kamal Mustafa, to move away from their leader. There is no difference between AH,Dr Farooq Sattar, or Kamal Mustafa, all 3D vision. The best option for Karachiites and all from Sindh is to support PTI, relatively much better choice. Mustafa Kamal seems to have lost his sense. He has forgotten that he was brought, funded and protected by the establishment to destroy MQM. Since he has miserably failed in it so he has retorted to smearing game. I have nothing to do with MQM but I admire them that they are still surviving despite being subjected to worst kind of atrocity, torture, kidnapping and killing by the administration. Unlike Mustafa Kamal MQM (P) leadership stayed in Pakistan and faced the worst treatment one can imagine. Mustafa Kamal and leaders of all the parties should join hands with Nawaz Shareef to flush out the influence of administration in politics. I don't understand why do many view establishment as alien, even if establishment brokered MQM-PSP alliance deal what is wrong in it. All establishments are 100% Pakistani like anyone else they are also striving hard for a better & peaceful Pakistan. All establishments of Pakistan are our own we should love, respect & appreciate their efforts towards building a better & stronger Pakistan. I hope people of Karachi will get new honest leaders who can provide peace and security. As far as MQM and PSP are concerned I think they are done and Karachi will be much better off if they vote for PTI or newly formed alliance PAI candidates. Dear Mustafa Kamal, Are you an independent and conscientious leader of the public or an employee of the so called establishment? Please consult your conscience and let us know in your next press conference. My view of the leadership is that a leader should be imbued with the sense of service to the people and be an independent person working for interests of his constituency and the country simultaneously. He should not be serving special interest and any establishment. Regards. MK you are on the right path just keep on going its a difficult journey but not impossible, humble suggestion start educating our future generations by setting up some sort of free tuition centers. 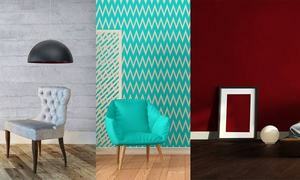 You have the resource utilize it now. Use it or loose it.